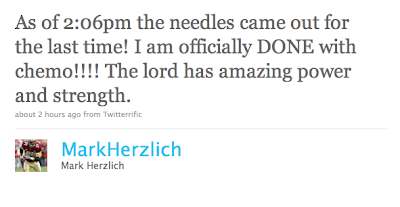 Mark Herzlich had his last chemo treatment today. He will now go through a series of scans and talks with doctors to set a date for surgery to insert a rod into his left femur, which has been compromised by the cancer and radiation treatments. This is an amazing milestone in Mark’s treatment and recovery. Amazing! Mark, Here we go. Stay Up! Now begins The Return. Thanks for this blog, it's really nice. I think we can learn many things from this. This blog help me a lot.